This decadently delicious recipe is dedicated to the AMC Cookware team! It’s made just for you! Thanks to Chris Koekemoer, Deon van Staden, Kaye Cox, Tamsyn Stockenstroom and Nariman Arnold and to all the AMC fairies that have added a lots of sparkle to my projects! What a year it’s been….we have worked on the Post recipe page, The Daily News/Star newspaper recipe columns with Angela Day, the Mela cooking show, cooking shows and demos, and the Holi Cow…..with the AMC team being the wind beneath my wings! The most amazing thing is that I have known the AMC brand my whole life….my mom got her set in 1970 and it’s still going strong and it’s going strong in Canada, nogal!!! The set of pots live with my elder brother! As you know by now…I love shoes….and I love my cookware just as much….cooking with an AMC pot is like walking down a street in Louboutins! And my cookware works really hard…they are literally in the wash, out and back on the heat! I have shared my favourite recipes through this blog and AMC have made so much of this possible! 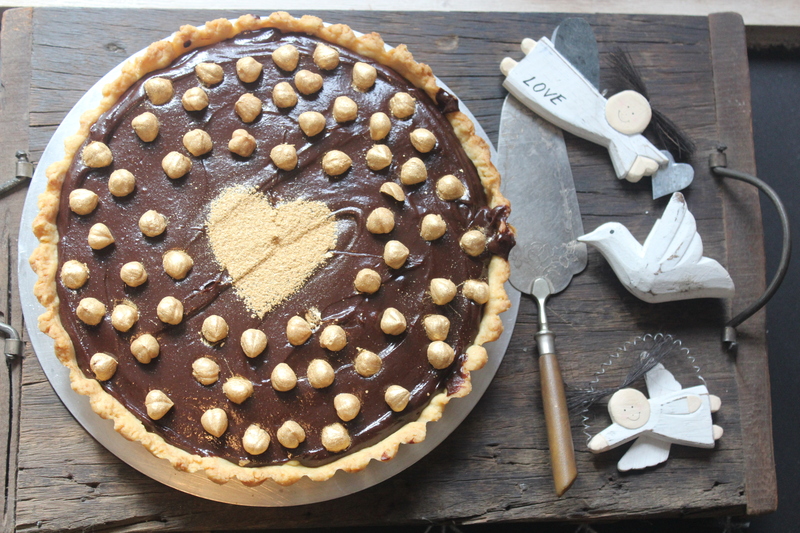 I have put together all my favourite favourites in this recipe….there’s a rich buttery pastry, Belgian dark chocolate, Frangelico and roasted hazelnuts. If you love whole nut chocolate, this recipe is for you! I simply love it! I garnish this with hazelnuts that are tossed in gold dust…this time I added a big gold heart for the AMC Cookware team!!! 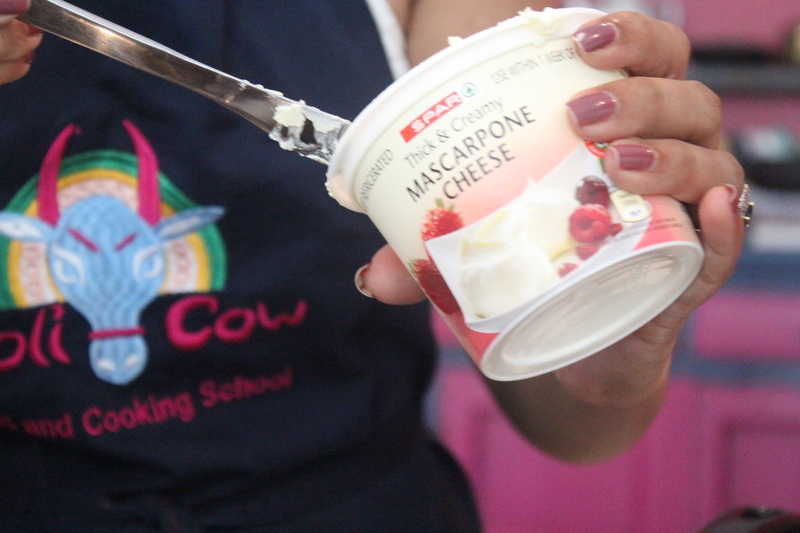 Spar mascarpone….gets the thumbs up! Thanks for the amazing year….thanks for the support and the awesome prizes! Thanks on behalf of our blog lovers too! AMC cookware love….at Holi Cow! Slice the butter into little cubes. Add the sugar and mix lightly. Lightly beat the egg and add to the crumbed mixture. Use your fingertips to lightly work into soft dough. Add the iced water and work lightly. Take care not to overwork the dough as this could make the pastry heavy. Refrigerate the dough for 5 – 10 minutes and then roll out into a round large enough to cover a greased 23cm loose bottom pie tin. The pastry should go up 3cm up the sides of the tin. Prick the pastry with a fork and leave to chill in a refrigerator for 30 minutes. Cover the pastry with baking paper and fill with beans – this is called blind baking the pastry. Remove the beans and baking paper and bake for another five minutes. Heat the cream with the sugar and vanilla paste in an AMC Chef’s Pan until it starts to bubble around the edges –remove from the heat. 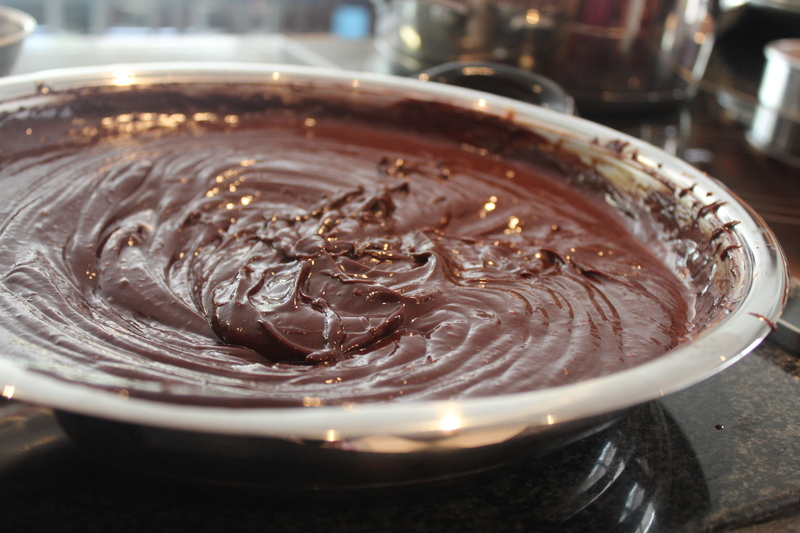 Add the chopped chocolate and mix gently. Mix until the chocolate melts into a smooth sauce. Add the Frangelico and leave aside to cool slightly. Gently whisk the cold butter into the chocolate – and thicken. Use a spatula to stir the mixture and stir until smooth. Toss the hazelnuts in the gold dust and garnish with roasted hazelnuts. Once the chocolate has set, slice and serve with whipped cream.